On February 17, 1872, at Bagumbayan (Luzon) three Native Catholic priests, Fathers Mariano Gomez, Jose Burgos and Jocinto Zamora (Gomburza) was publicly executed, by garrote. The Spaniards charged the priests with treason and sedition in connection with the uprising of the 1872 Cavite Mutiny. The three priests led a campaign against the abusive Spanish friars and equal rights among native priests that resulted conflict with the other Spanish friars, many believe it led to their fate. Their deaths awakened the fire that’s been burning inside the native Filipino people (Indios) for over 300 years of abuse and slavery. 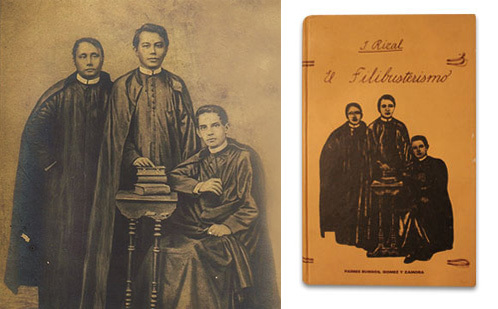 Ilustrados like Dr. Jose Rizal dedicated his second novel, El Filibusterismo (1891) to the memory of the 3 priests, Fathers Mariano Gomez, Jose Burgos and Jocinto Zamora. Noted: Jose Rizal’s older brother, Paciano Rizal was associated with Father Burgos and advice Jose to change his name to Jose Rizal for his safety against the Spanish authorities and Friars after the execution of the three priests, Gomburza.